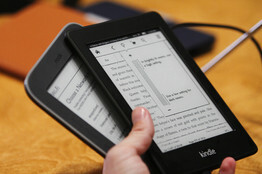 The End of the E-Reader? In 2007, the must have gadget for any avid reader was either Amazon’s Kindle or Barnes & Noble’s Nook. These E-Readers were revolutionary in that they allowed users to store and read multiple books on a conveniently sized device that was modestly priced. Although it seems like just yesterday that these devices were flying off the shelves, today E-readers are on the verge of extinction. Julie continued, “If I ever did want to upgrade, it would probably be to a tablet, like the Kindle Fire.” This brings us to the biggest problem, the emerging popularity of tablets. In 2007 the idea of tablets were still being tossed around a boardroom somewhere but that’s not the case today. Tablets, like Apple’s iPAD Google’s Nexus 7 and Amazon’s Kindle Fire, are affordable and more technologically sophisticated than most E-readers. The trends are showing that by 2015 E-readers might in fact be completely obsolete despite major advancements in the technology. The manufacturers of these devices will need to come up with a strategy to target a niche market, and keep E-readers afloat.